Holy Cats! I love this dish!!!! A perfectly ripe mango is a beautiful thing. They’re in season right now and I just happened to have 2 sitting on my counter smelling divine. I also happened to have boneless, skinless chicken thighs thawing in the fridge so with the power of The Google, I went to work trying to find something to cook for dinner that would use both. Happily I ran across this recipe from food.com – the post said that the original recipe came from Canadian Living Magazine. Apparently it’s from the more tropical part of Canada. I’m all for eating locally and seasonally, but I’d hate to think that my Canadian friends had to miss out on juicy mangoes just because they’re up north! 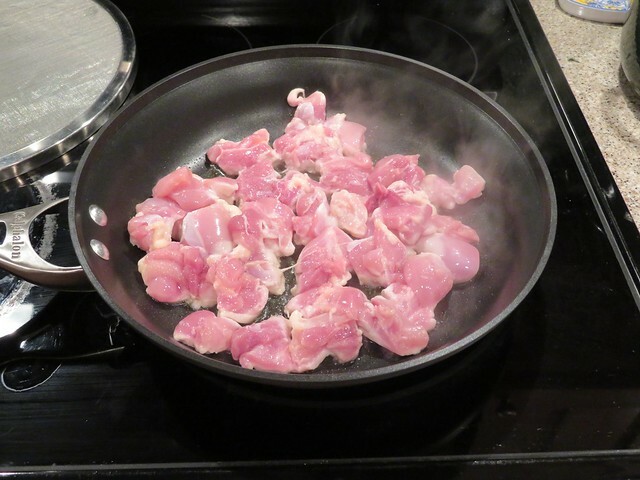 A couple of notes: I used about 1 pound of boneless, skinless chicken thighs but you can certainly use good old boneless, skinless chicken breasts too. Also, I had a whole bag of those tiny bell peppers in the fridge so that’s what I used. You can substitute a small regular red and a small yellow or orange bell pepper and save yourself a lot of prep work. You need about 2 cups of peppers total. RICE! Before you start cooking anything else, prepare 1½ cups of dry rice (basmati, brown, long grain, or even jasmine would be fine) in 3 cups of water. Use a rice cooker or the trusty old pan method. 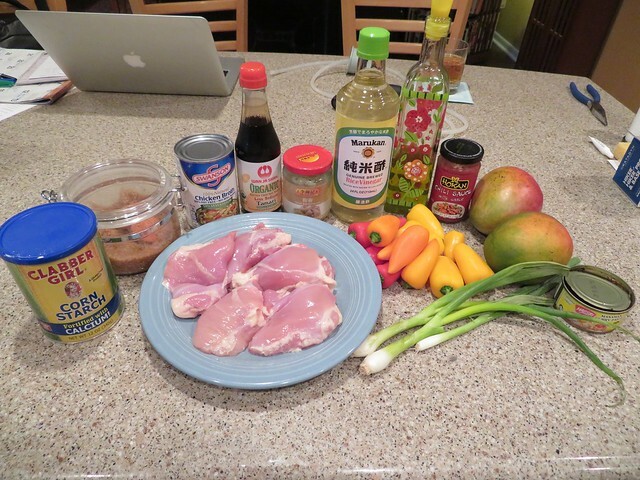 Rice takes about 20 minutes which will give you ample time to prepare the Mango Chicken Stir Fry. 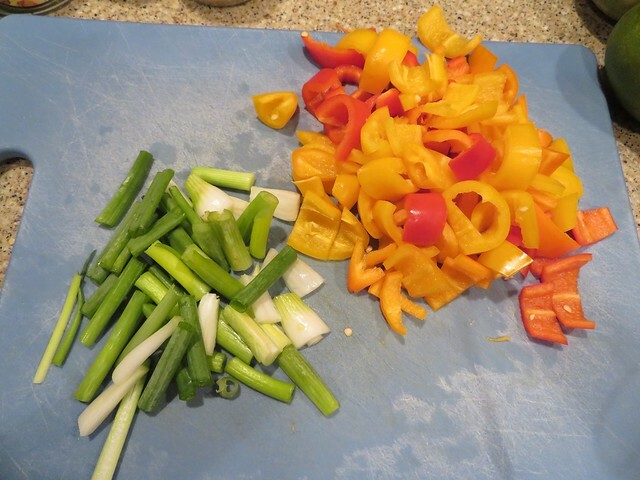 Chopping – Remove the seeds and cut the bell peppers into 1 inch pieces. I like little chunks rather than big long strips. Chop 3 green onions into 1 inch segments. I built my sauce right in a measuring cup. 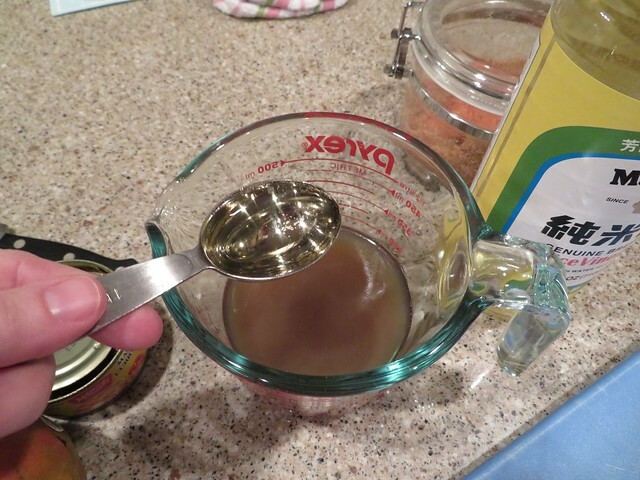 First, measure out 2/3 cup of chicken broth then add 2 Tablespoons of soy sauce (I use Tamari for gluten free), and 2 Tablespoons of rice vinegar. 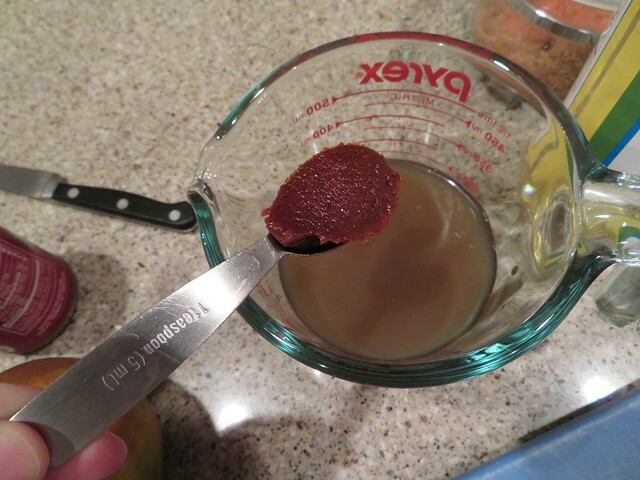 Add 1 Tablespoon of brown sugar and 2-4 teaspoons of curry paste. I used 2 teaspoons because my curry paste was pretty spicy. You can always add more. 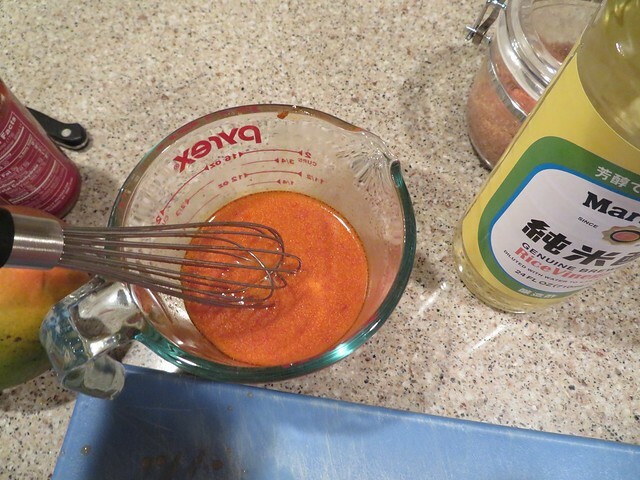 Add 4 teaspoons of cornstarch for a thickener, and then because I can’t cook anything Asian without it, add ½-1 Tablespoons of chili garlic sauce. 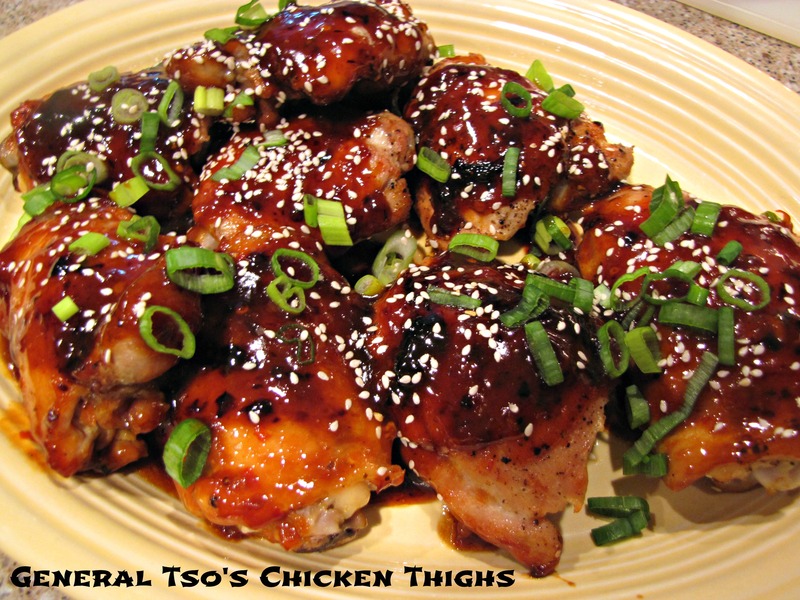 Chili Garlic Sauce is spicy but more of a flavorful spiciness than a burn your face off spiciness. I love it. Whisk it all together to dissolve the sugar and incorporate the cornstarch then set aside. 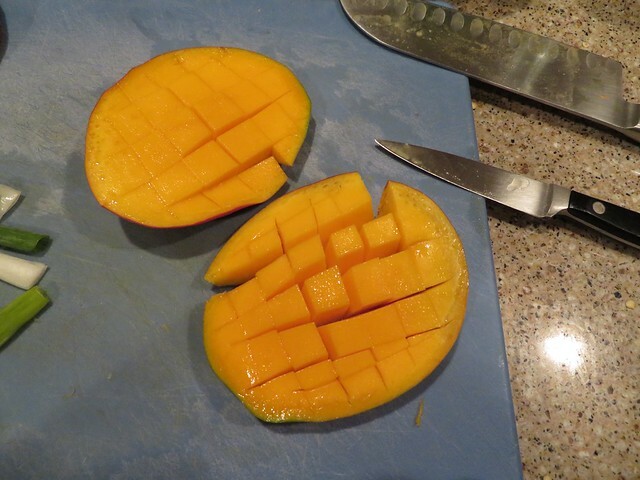 Mangoes are easier to cut once you realize that they have a huge oblong pit in the center. Cut a disc away from each side of the pit, score it into squares with a small knife, then turn it inside out and cut the squares away from the skin. For full mango slicing directions with more photos, click here. I have about 1½ cups of mango. 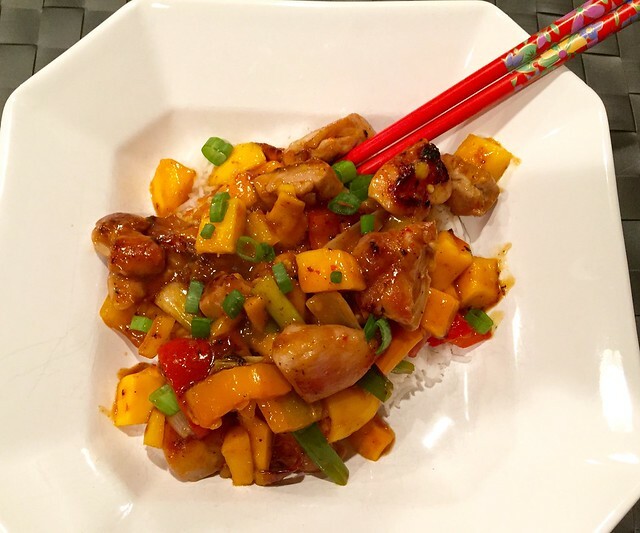 The ripe mango is what took this recipe totally over the top but my guess is that you could also use some frozen mango chunks if you are in a bind. Ack! I have no photos of cutting up the chicken but you can get the idea. Trim away any big globs of fat and cut the chicken into bite sized pieces. Heat 1-2 Tablespoons of oil in a wok or a large non-stick pan. When the oil is hot, add the chicken pieces to the pan and then turn the heat up pretty high – my stove setting was on 9 out of 10. This will allow the chicken to cook quickly, stay tender, but also get nice browned caramelized bits. 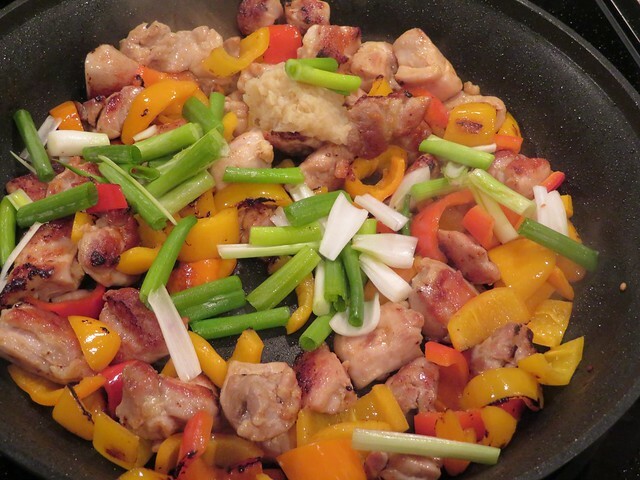 Stir the chicken once or twice around in the pan so all the sides brown. 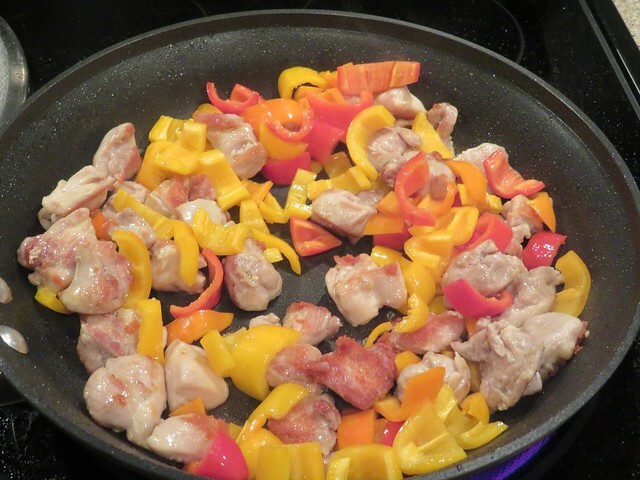 After 4-5 minutes, when the chicken is almost cooked through, add the peppers to the pan and cook for an additional 2-3 minutes. 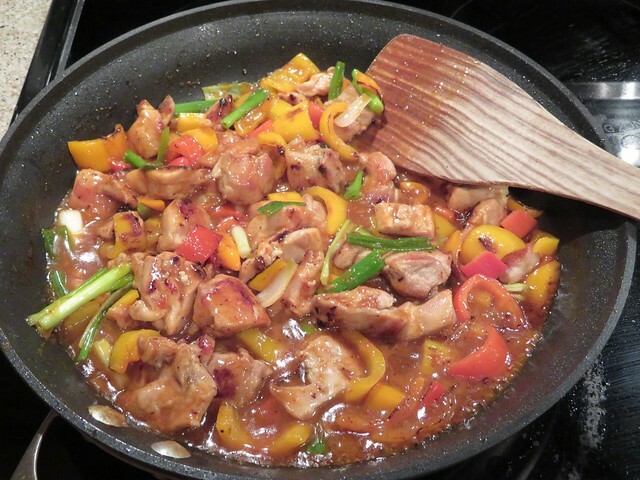 See the nice browned bits on both the peppers and the chicken? That’s what a high heat will get you. However with high heat comes the need to keep a close eye on your pan. Add the green onions and 1 Tablespoon of chopped ginger to the pan. Turn the heat down to medium now that the chicken is fully cooked. Give the sauce one more quick whisk in case anything has settled and add it to the pan. 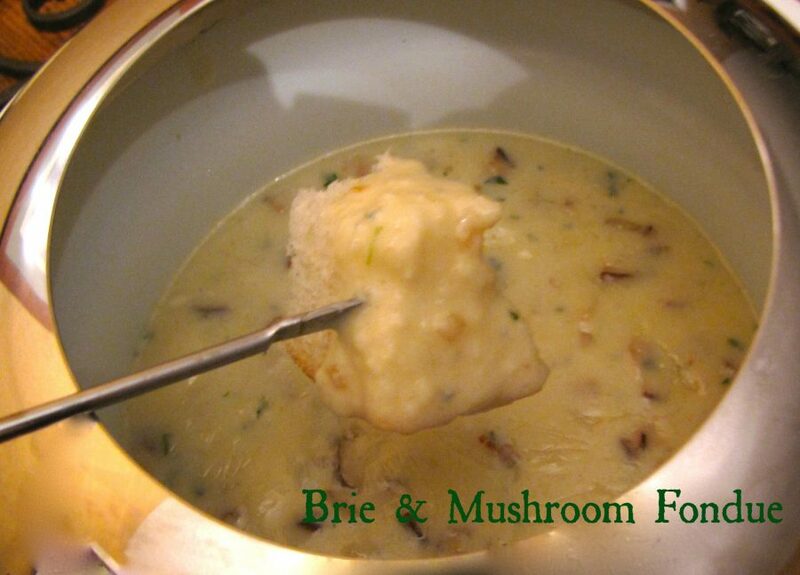 Stir to combine and cook for 1-2 minutes to thicken. 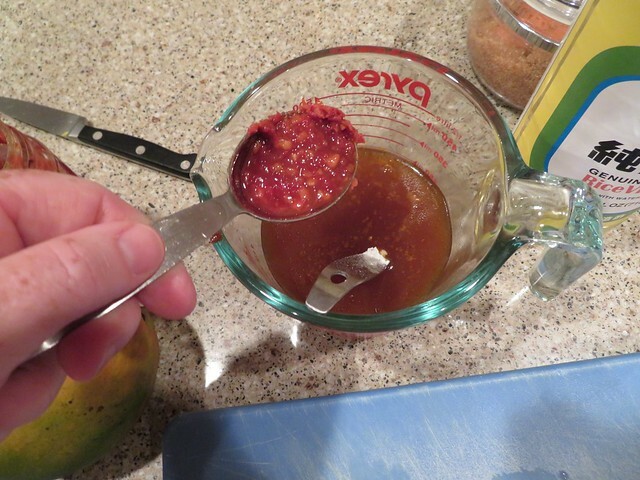 This thickens very quickly so pull it off the heat once you have a nice saucy consistency. 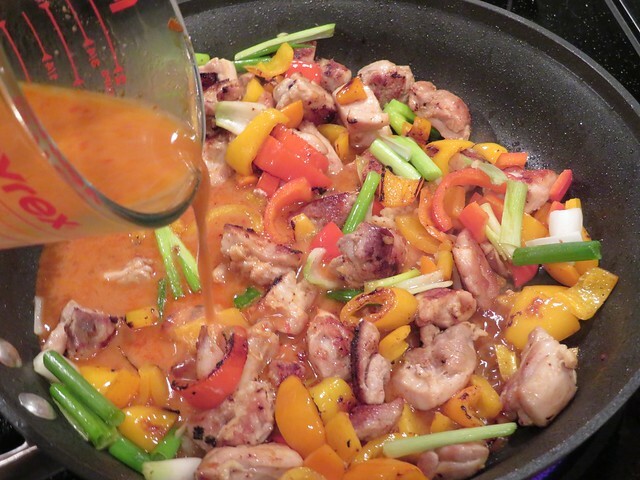 Once off the heat, add the mango chunks and fold them gently into the chicken and veggies. 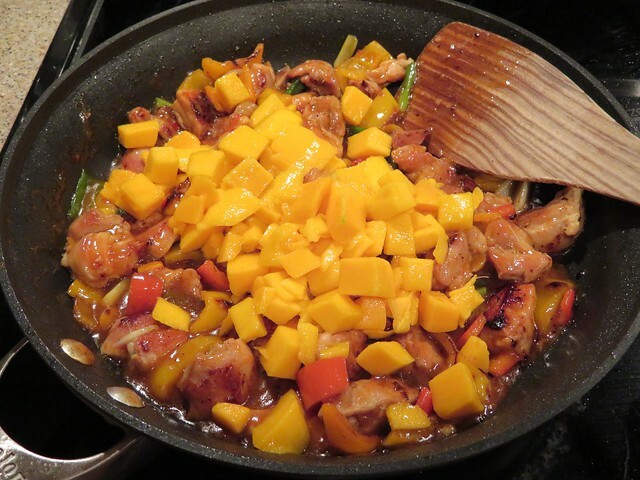 To serve, put a portion of rice into the bottom of a bowl and add a big scoop of the Mango Chicken Stir Fry on top. You can pretty it up with a garnish of a few green onion tops or even chopped cilantro. 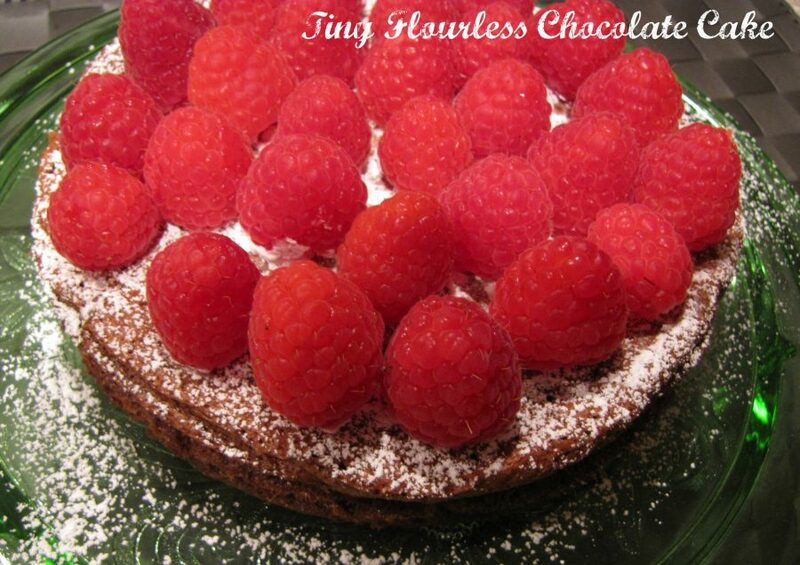 The original recipe suggested garnishing with cashews too which I think is an excellent idea. Next time I’ll pick up a package of my favorite Sriracha Cashews for this recipe. Next time I might also add some green peas…I do love my green peas in curries and stir fry dishes. Jim and I both gobbled this right up. It has a terrific combination of flavors. Because you control the level of spiciness and it’s got that whole sweet and spicy thing going on, it would be great for the whole family. 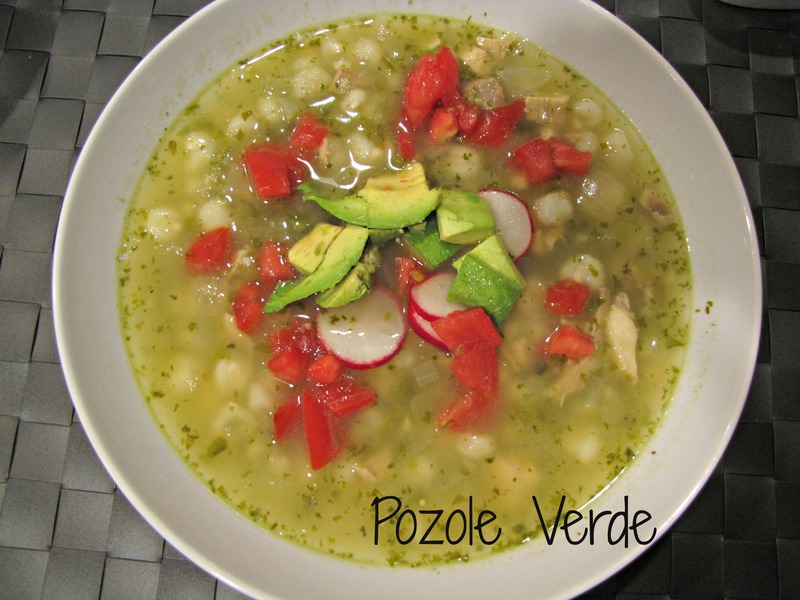 Because it cooks in the time it takes to make the rice, I think this is definitely a Weeknight Wonder. Mango Chicken Stir Fry is definitely a new favorite! This is definitely being cooked this week here!